Renault has released official images and details of the long-awaited successor to the Laguna saloon. Called the Talisman, it's set to go on sale in Europe at the end of the year, but there's bad news for any Brits who like the look of it; there are currently no plans to bring it over here. The Talisman name was confirmed earlier this month, but Renault bosses also stated that, like the new Espace MPV, it won't be engineered for right-hand drive. The previous Laguna was axed in this country in 2011 due to slow sales, while saloon rivals such as the Honda Accord have also bowed out of the market. Bosses claim the market in Europe for large saloons is more stable than the UK. The new Talisman gets a sleeker, more executive profile in-line with market leaders such as the VW Passat and Mazda 6. The front-end design is believed to be the new Renault family face that we'll eventually see on next year's new Megane hatch, and an adaptation of that currently seen on the Kadjar SUV. It's 4.85 metres long, 70mm longer than the Passat, and 1.87 metres wide. The sloping rear roofline is indicative of the saloon fashion nowadays, while the large LED rear lights give the back-end a distinctive look. Inside, the Talisman gets an all-new dash design, with an 8.7-inch portrait-angled touchscreen system borrowed from the new Espace. New tech includes LED headlamps, a head-up display, BOSE surround sound and hands-free parking, and there''s a digital instrument cluster as standard. The firm is also claiming the larger saloon offers best-in-class passenger space, and an impressive 608-litre boot. As you'd expect with a Renault, the latest active safety systems feature aiming it up with the best in its class. Under the skin Renault has pushed the boat out, claiming the Talisman is the only car in its class to offer both four-wheel steering and adaptive damping combined for "dynamic, agile handling" and "outstanding ride comfort". At launch there will be two petrol and three diesel engines on offer; a 148bhp and 197bhp TCe turbo petrol, mated exclusively to a seven-speed dual clutch automatic, while there's 109bhp, 128bhp and 158bhp dCI diesels with either a six-speed manual or six-speed dual-clutch autobox. Renault claims the lowest-powered diesel emits as low as 95g/km of CO2. 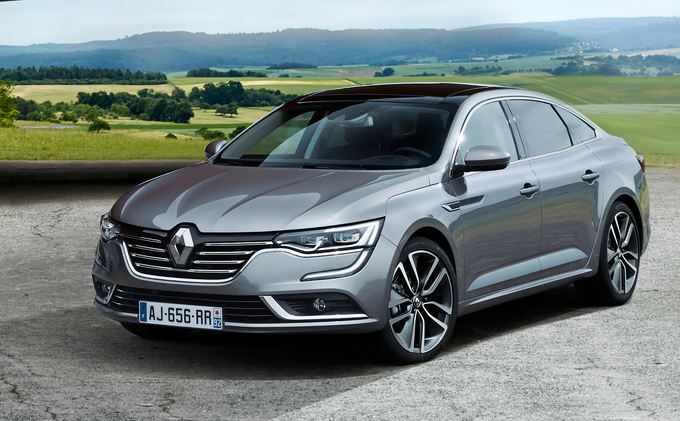 Renault bosses have claimed we'll be seeing the Talisman in Europe at the beginning of 2016, before it is rolled out in Turkey and North African markets later on.